Every couple of years there's an overblown reaction to the threat of nuclear war; it's usually the result of posturing by the major powers as one tries to goad the other, but the actual chances of an all out nuclear holocaust remain slim because even the most crazed megalomaniac is aware of the slim pickings on offer. However, all this nuclear hysteria naturally causes a lot of consternation amongst the general public who are relegated to the sidelines and can merely watch, much like a set of girlfriends outside a kebab shop on a Saturday night as their boyfriends square up to each other over a perceived slight. It's a hysteria which is somewhat entrenched in hyperbole in the 21st century, but back in the early 1980s, as the Cold War rumbled on, it was a threat which felt uncomfortably real and, to those who invested in nuclear fallout shelters, somewhat inevitable. 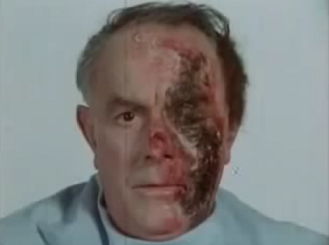 British television tapped into this holocaustal zeitgeist most notably with the bleak nuclear ode Threads in 1984, but preceding this by a couple of years was a detailed look at the effects of a nuclear blast in A Guide to Armageddon. Narrated by Ludovic Kennedy, A Guide to Armageddon is part of the science documentary series Q.E.D and considers a hypothetical scenario whereby a megaton nuclear weapon explodes a mile above St Paul's Cathedral, London and whether we could survive it. Heat - At the initial detonation of a nuclear weapon, the temperature at the centre of the explosion will reach 20 million degrees centigrade. This inanely intense heat immediately causes people and objects to burst into flames and melt or char, the bronze cross atop St Paul's Cathedral, for example, would melt in seconds and the thermal rays would boil the shallow areas of the lake in St James Park where temperatures would reach 4,000 degrees centigrade. 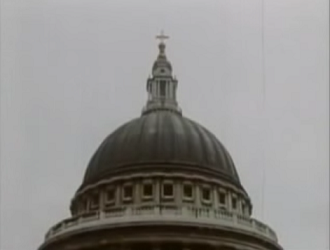 Blast - Three seconds after the explosion, the blast wave arrives and obliterates St Paul's Cathedral with ease. And, coupled with the enormous pressure, winds of up to 2,000mph are created and anything within a three and a half mile radius is completely destroyed almost instantly. Further out, the impact on human life is still highly dramatic with people being smashed into buildings by 150mph winds whilst falling debris and flying glass can be fatal. Fallout - All the earth and debris at the site of a nuclear blast is sucked up into the air and vaporised which causes it to become highly radioactive. Known as fallout, this invisible dust slowly rains back down over a period of weeks and remains dangerous to living cells for two weeks. Exposure to this fallout will gradually cause a series of effects such as nausea, diarrhoea, loss of hair, bleeding from all orifices, delirium and, within three months, the chance of death is exceptionally high. A Guide to Armageddon also features a look at two couples taking shelter from such a blast. Joy and Erik are sealed within a £10,000 steel bunker which is six feet underground and contains a number of features such as air filtration and sanitation systems. At the other end of the shelter spectrum are Ken and Elizabeth who have built the government recommended domestic nuclear shelter - a glorified trench measuring 5ft 6in by 3ft and located less than 4ft underground. Despite the varying levels of protection offered by these shelters, the programme ends on a solemn note by pointing out that the couples' real problems may only begin when they emerge after two weeks and are confronted by the loss of electricity, communication, transport and food supplies. Airing as part of the inaugral series of Q.E.D in 1982 on BBC1, A Guide to Armageddon was originally due to be transmitted on 26th May that year, but was postponed until 26th July. The programme was repeated in 1983 and 84, but has not been aired since, although a copy has made its way onto YouTube. Many of the scenes of destruction and crumbling, ruined buildings were filmed at the disused Beckton Gasworks, London. "The statistics of casualties and destruction to buildings are all calculated and we simply report the statistics in scientific terms. The programme is not like 'The War Game' in the sense that there is not a lot of blood and gore and people evaporating. We simply explain what the figures mean when they are translated into a medium-size nuclear warhead exploding over a major city like London. We try to spell out the chances of survival. We think people are entitled to interpret the facts themselves"
The show was praised at the time with The Telegraph referring to it as "Maybe the most important television programme ever networked in Britain" whilst The Guardian described it as "A cumulative portrait of horror whose impact might well prove more lasting than any ficionalised or dramatised version". 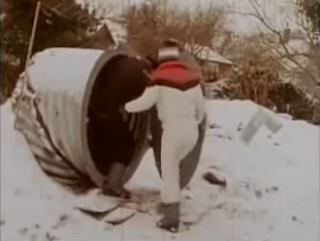 A follow up episode aired four days later on BBC2 and was titled The Underground Test, a 45 minute feature on the fortunes of the two couples seen building their own shelters in the parent programme. An absolutely huge fan of Threads, there's something incredibly macabre about the impact of nuclear war that fascinates myself and countless others. British television, too, has always held it up as a most peculiar subject of interest and exhibited real flair in conveying the minutiae of nuclear hell. Threads, of course, grabs all the plaudits due to it's intense bleakness and ability to numb the spirit whilst When the Wind Blows is a heartbreaking paean to British resolve. 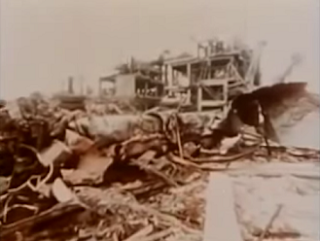 In 1980, a Panorama special If the Bomb Drops gave an outline of how society would react and cope in the event of a nuclear explosion. It was very much an all encompassing look at such a scenario with experts and officials weighing in on the structure and framework in place to help rebuild the country. A Guide to Armageddon, however, concentrates all of its energies on the immediate explosion and its initial effects. Foregoing any sense of Threads narrative or aforementioned Panorama interviews, A Guide to Armageddon guides the viewer through the horrors with an educational edge, but never descends into studious academia. Facts are laid out plainly with terrifying statistics and there's never any reference to complex mechanics such as the finer details of nuclear fission. However, far from being reductive, the programme is able to get its message across to everyone by the disturbing discourse on offer. And this message is bolstered by the wonderfully educated tones of Ludovic Kennedy who infuses the narration with real authority. Although not as chilling as Threads brand of bleak horror, the analysis of a nuclear explosion's effect on human health is a real stomach turner. Makeup is used to transform actors into burns victims for whom the chance of skin grafts would be almost impossible in a world where hygiene would now be considered a legend of the past. 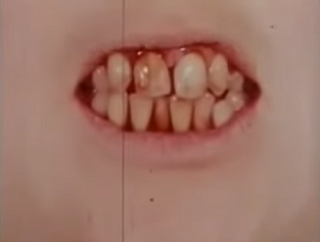 Particularly ghoulish is the baring of bleeding gums brought on by radiation sickness which made me wince and squirm rather uncomfortably in my seat. These after-effects of an explosion, though, all pale into insignificance when the focus shifts to the enormity of the actual explosion. The programme is very clever in detailing the effects at increasing distances from the blast site as it hammers home just how powerful a single explosion would be, with houses being completely levelled many, many miles from ground zero. And when you consider that an all out nuclear attack would involve multiple bombs at multiple sites, it's difficult to comprehend how 16 million Britons would be estimated to survive. The visual representation of these effects is probably one area where A Guide to Armageddon suffers. The quality of special effects available in 1982 is unable to stretch further than models being blown up, flames being superimposed over images or film sped up to heighten the destructive speed of the intense heat. However, some are effective; a particularly stomach churning sequence features a large slab of meat with it's fat melting off to allow tissues to be charred to a crisp to describe our feeble, natural protection. There's also a curious slowmo demonstration of the effects of flying glass on human skin, but with a pumpkin in place of human tissue and occasional camera cuts to elderly women and children for good measure. Needless pumpkin cruelty aside, the message is clear: a nuclear attack would be devastating and would render any city involved as unrecognisable and almost certainly unsalvageable. A Guide to Armageddon remains an intriguing time capsule from an era where the threat of nuclear war felt more real than it ever could today. Let us just be grateful that the ramifications of nuclear war are enough to engender a nuclear deterrence amongst even the most foolish owners of such weapons. 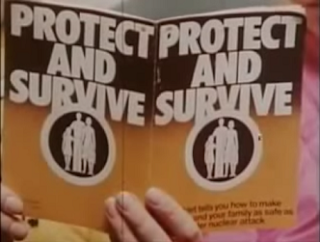 I'm not sure if the Panorama documentary precipitated the official publication of the Protect And Survive literature or was a response to it. It's difficult to tell. They both came out in 1980, but I can't find a specific release date for the Protect and Survive booklet. I'll try digging a bit deeper and see what came first! 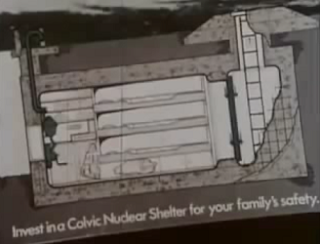 Couldn't help laugh at the chain smoking couple living in the fallout shelter, they were far too cosy. Got the sense being buried in the garden was their thing.